My husband’s favorite pasta dish is this one…half of what he loves about it is that every time we make it, we make it together. We open a bottle of wine, put on some music and start cooking! The four different meats; sausage, pancetta, ground beef and ground pork are cooked until very tender in a delicious tomato sauce. 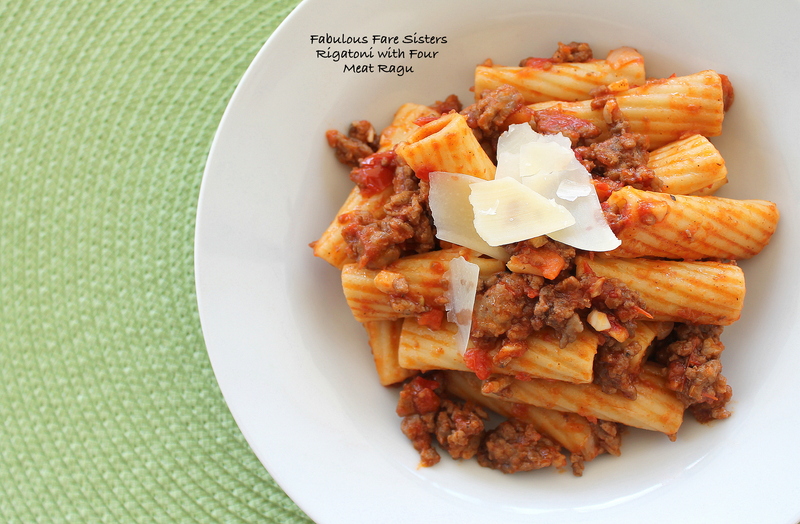 We have served this yummy pasta dish for many family and friend get-togethers…it’s always a huge hit. In a large deep skillet, crumble the sausages and start to brown on medium-high heat. Add in the pancetta and continue to cook for about 5-8 minutes; chopping the meat as small as possible. Add in the ground beef and ground pork and cook 8-10 minutes; again, chopping the meat as small as possible. Season with 1 teaspoon salt, fresh ground pepper to taste, and the allspice. Add in the diced carrots & onion and the minced garlic. Cook 5-8 minutes until carrots are tender. Pour in the red wine and the beef broth along with the crushed tomatoes. Bring to a simmer, put the lid on and cook on low a minimum of 20 minutes. Meanwhile, cook the Rigatoni as package directs; drain. 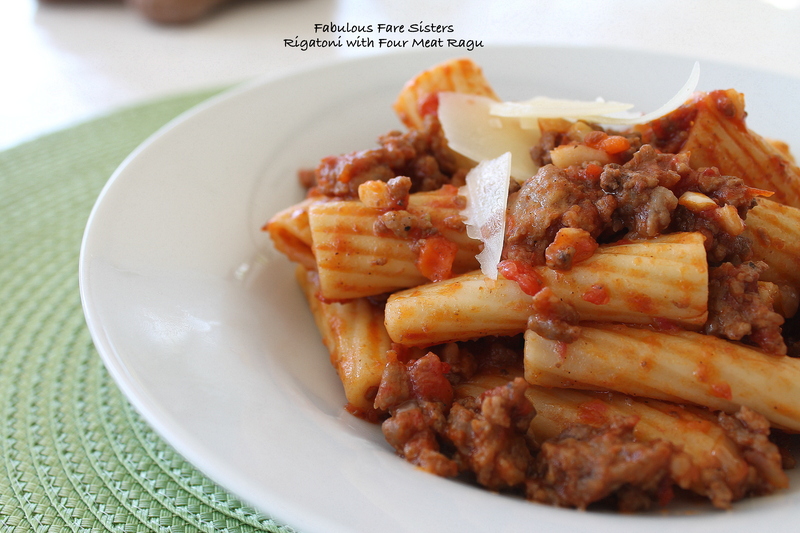 Combine the Rigatoni with the Four Meat Ragù and top with fresh parsley and Parmesan cheese. Serve immediately. Makes 6-8 servings. Now this is a CLASSIC! I love the wine of course and the pancetta in the dish but I’m intrigued by that touch of allspice! It seems so right! Thanks for sharing with us at Fiesta Friday!